The theme is flowers, using the text "All the flowers of tomorrow and in the seeds of today" by Willa Hoey. Cover: Neenah Classic Linen cover stock and gift wrap. Text: Crane Crest. Text and colophon written with Higgins Eternal Ink using Mitchell and Gillott 1086A nibs. A small envelope holds pressed flowers enclosed in Beinfang vellum, mounted on a single page. Package of zinnea seeds mounted on another single page with clear photo-mount corners. Bound with raffia over a dowel. 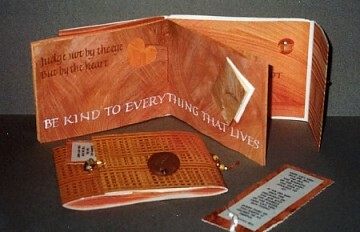 Book 6″ x 4½″ (15.2cm x 11.4cm).